Recommended citation: Nagao Y, Nishioka S, Koresawa K. Prevalence of Viral Liver Disease and Oral Lichen Planus in Patients Who Visited Dental Clinics: A Study by the Ehime Dental Association. OBM Hepatology and Gastroenterology 2019;3(2):10; doi:10.21926/obm.hg.1902016. Background: The association between hepatitis C virus (HCV) infection and oral lichen planus (OLP), an extrahepatic manifestation, is well known. There are still patients with viral liver disease who are not receiving appropriate treatment in this country. This prospective study aimed to evaluate the prevalence ofOLP and untreated hepatitis virusinfection in patients who visited dental clinics in Ehime prefecture in western Japan. Methods: Patients who visited 35 dental clinics in Japan from March 2018 to June 2018 were analyzed. The items examined are as follows: (1) the number of patients who visited the dental clinics, (2) the number of OLP patients, HCV-infected patients, and hepatitis B virus (HBV)-infected patients, (3) the number of OLP patients, HCV-infected patients and HBV-infected patients encouraged to be examined for liver diseases. Results: There were 19,077 patients in total and the numbers of OLP, HCV-infected and HBV-infected patients were 42, 69 and 76, respectively. Of the OLP patients, 66.7% (28/42) were encouraged to be examined for liver disease and 47.6% (20/42) had complications of liver disease. The most common complication was HCV-related liver disease (70%, 14/20) and 78.6% had not eliminated HCV (p=0.0287). The dentists encouraged 33.3% of the HCV-infected patients and 36.8% of the HBV-infected patients to be investigated by physicians for liver disease. Of the 69 patients with hepatitis C, the rate of persistent infection was significantly higher than that with viral clearance (72.5%, p=0.0001). Conclusions: Among the various dental clinics in Ehime prefecture, half of the OLP patients had complications of liver disease, with many of whom suffering from persistent HCV infection. Dentists need to have knowledge of liver disease and infection control measures and provide information through medical cooperation. Because Japan has one of the highest rates of hepatitis C virus (HCV) infection in the industrialized world, chronic hepatitis C continues to be a major disease burden. The Japan Society of Hepatology (JSH) estimated that 1.5 to 2 million individuals are infected with HCV in this country . About 30,000 deaths occur from hepatocellular carcinoma (HCC) each year  and the death rate is higher in the western than eastern Japan. 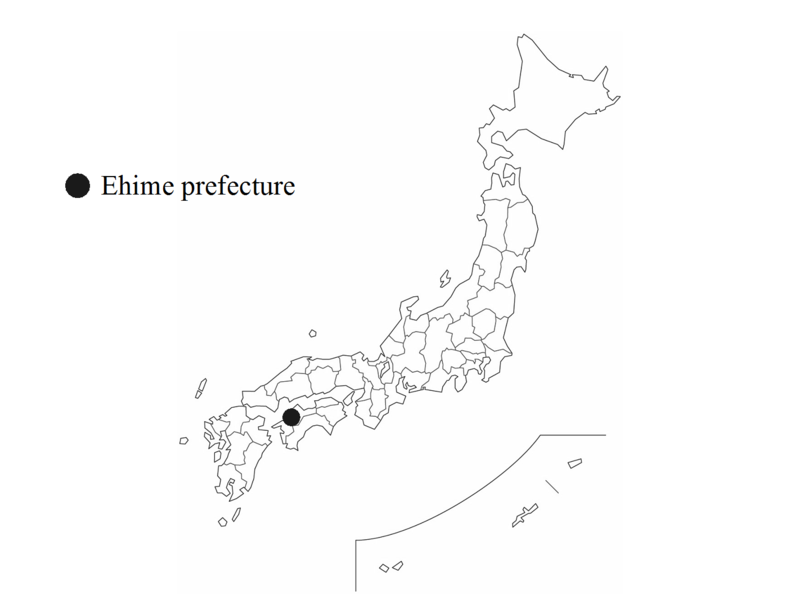 Ehime prefecture, located on Shikoku island in western Japan, is one of the prefectures with the highest death rates due to HCC (Figure 1). Figure 1 The locations of the 36 dental clinics in western Japan. The black circle indicates Ehime prefecture. Treatment of chronic hepatitis C has advanced dramatically in the past decade with the introduction of direct-acting antivirals (DAAs) [3,4,5,6]. DAA regimens have fewer side effects, shorter treatment courses, and much higher cure rates (>95%) than previous, interferon-based regimens. However, between 800,000 and one million HCV-infected Japanese individuals remain untreated, many unaware that they are infected . HCV also is known to induce extrahepatic manifestations  and it has been reported that up to 74% of HCV-infected patients show at least one extrahepatic manifestation . Oral lichen planus (OLP), a mucocutaneous disorder, is one of the extrahepatic manifestations strongly associated with HCV infection. Analysis by meta-analysis showed that OLP is 2.8 - 5.4 times more likely to develop in the patients with HCV infection [9,10]. We showed that, of patients with OLP, 62% had HCV antibodies and 60% had HCV RNA in their serum . Furthermore, there is evidence that treatment with DAAs improves OLP associated with HCV-related infection [12,13,14,15]. In recent years, by retrospective and prospective studies, we have succeeded in identifying, among patients who visited general dentists, individuals who were persistently infected with HCV and guiding them to antiviral therapy [16,17]. These studies showed the important role of dentists in the discovery and treatment of HCV infection among patients with oral mucosal diseases. How many individuals with OLP and viral liver disease are there among the patients who visit the general dental clinics in Ehime prefecture? In this study, we examined prospectively the prevalence of OLP, HCV infection and hepatitis B virus (HBV) infection in patients who visited these dental clinics through the collaboration between dental and medical practitioners. The study was approved by the Ethics Committee of Saga University (reference number: 29-56) in accordance with the Declaration of Helsinki. Written informed consent for participation in the study was obtained from the director of each dental clinic. Participation of patients was obtained through an opt-out methodology. From March 2018 to June 2018, 36 dental clinics, which belong to the Ehime Dental Association in Ehime prefecture, were enrolled to participate in this prospective study. One institution withdrew from the study because data was lost in a natural disaster. Parameters examined during the three months are: the number of all patients who visited the dental offices, the number of OLP patients, the number of HCV-infected patients, the number of HBV-infected patients, the number of OLP patients encouraged to be examined for liver disease, the number of HCV-infected patients encouraged to be examined by physicians for liver disease and the number of HBV-infected patients encouraged to be examined by physicians for liver disease. The diagnosis of OLP was made on the basis of clinical and/or histopathological features. In preparation for surveys of OLP, we conducted training and coordinated the examiners in December 2017 and February 2018 in order to minimize the variation among different examiners. The diagnosis of liver disease in patients with OLP was determined by referral and consultation with a family physician or liver specialist. These physicians usually tested for antibodies against HCV (anti-HCV) and for hepatitis B surface antigen (HBsAg). The dentists interviewed each patient to determine their clinical history and systemic diseases, including liver disease, and offered testing for HCV and HBV infection and referral to a primary physician. An introductory letter composed for this research was used. Therefore, we obtained such information in cooperation with a medical institution. The relationship between OLP and liver disease was analyzed using the χ2-test. The statistical analyses were conducted using JMP Version 13.1.0 software (SAS Institute, Cary, NC, USA). The level of statistical significance was de­fined as P <0.05. In total, 19,077 patients were collected and the numbers of OLP, HCV-infected and HBV-infected patients were 42, 69 and 76, respectively (Table 1). The prevalence rates of OLP, HCV infection, and HBV infection were 0.2% (42/19,077), 0.4% (69/19,077), and 0.4% (76/19,077), respectively. The 42 OLP patients were 25 men and 17 women with an average age of 64.8 years. The 69 HCV-infected patients were 46 men and 23 women with an average age of 69.3 years. The 76 HBV-infected patients were 46 men and 30 women with an average age of 64.4 years. Table 1 Characteristics of subjects in this study. The rates of referral for liver disease from dentists to physicians for OLP patients,　HCV-infected patients, and HBV-infected patients were 66.7% (28/42), 33.3% (23/69) and 36.8% (28/76), respectively. Of the 42 patients with OLP, 28 were advised to undergo examination for liver disease, including testing for HBV and HCV infection. The dentist interviewed the remaining 14 for histories of liver disease. The liver diagnoses of these 42 patients were: chronic hepatitis C (CH-C, 9 patients), CH-C with sustained virological response (SVR, 3 patients), CH-C & post HCV-related HCC (1 patient), HCV-related liver cirrhosis (LC-C, 1 patient), chronic hepatitis B (CH-B, 4 patients), fatty liver (2 patients), and normal liver (22 patients) (Table 2). The most frequent liver disease among the OLP patients was HCV-related liver disease (70%, 14 of 20) and these patients had not been cured of their HCV infection (78.8%, 11 of 14, p=0.0287). Table 2 Diagnosis of liver disease in patients with oral lichen planus and viral liver disease. The diagnoses of the 145 patients with viral liver diseases were: CH-C (42 patients), during treatment of CH-C (2 patients), CH-C with SVR (19 patients), LC-C (1 patient), LC-C & post-HCV-related HCC (1 patient), post-HCV-related HCC (2 patients), post-HCV-related HCC & alcoholic liver disease (ALD, 2 patients), history of HBV infection (4 patients), HBV asymptomatic carriers (20 patients), HBV asymptomatic carriers with fatty liver (2 patients), CH-B (43 patients), CH-B with fatty liver (2 patients), HBV-related liver cirrhosis (LC-B, 1 patient), post HBV-related HCC (3 patients), and LC-B & post HBV-related HCC (1 patient). Among the patients with HCV-related liver disease (69 patients), the rate of persistent infection was significantly higher than that with viral clearance (72.5%, p=0.0001). It is arguable that the development of therapy for hepatitis C in Japan is almost complete. Treatment with DAAs is now established, with a shortened treatment period of 8 weeks, pangenotypic treatment showing an effect on any HCV genotype. SVR rates following treatment with DAAs close to 100% regardless of resistance mutations or earlier treatment, and almost no side effects . However, because there is a risk of HCC even after achieving SVR with DAAs, follow-up is indispensable . The biggest problem in our country is identifying HCV-infected individuals who have not been treated in order to eliminate HCV infection. HCV infection is known to be a cause of OLP and the prevalence of OLP is approximately 0.2% to 2% of the population . The prevalence of OLP in HCV-infected individuals is very high and varies depending on geographical areas [9,10,20]. The rates of HCV infection in OLP are especially high in Japan and Italy . We reported previously that the prevalence of OLP in HCV-infected inhabitants was from 6.6 to 23.8% in Kyushu (X town) [22,23,24] and from 8.8 to 23.1% in Hiroshima prefecture (O town) of Japan [25,26]. We identified genetic variants associated with HCV-infected OLP in the Japanese and Italian populations. It was found that rs884000 (NRP2), rs538399 (IGFBP4), and rs9461799 (HLA-DR/DQ) were associated with altered risk of HCV-associated OLP . In this study, we investigated how many patients with OLP or viral liver disease visited dental clinics in Ehime prefecture where the liver cancer mortality rate is high. The domestic ranking of mortality rate for liver cancer in Ehime prefecture was 7th in 2015, 10th in 2016, and 7th in 2017. Twenty of 42 (47.6%) patients with OLP had complications of liver disease. The most frequent disease was HCV-related liver disease (70%), and about 80% had not eliminated the virus. In addition, among the patients who visited the dental clinics, 145 had viral liver disease, 69 patients with HCV-related liver disease and 76 with HBV-associated liver diseases. Of those with HCV-related liver disease, 72.5% (p=0.0001) were persistently infected and had not eliminated the virus. Dentists may play a vital role by introducing untreated HCV-infected patients to hepatologists so that they can receive antiviral therapy and achieve SVR. HBV infection does not appear to play a major role in the causation of OLP. Several studies demonstrated no relationship between OLP and HBV infection [28,29]. However, Denli et al. reported that HBV positive rates (17.1%) in OLP patients were significantly higher than in controls . According to the results of our study, prevalence of HBV infection in patients with OLP was 9.5% (4/42 patients). This prevalence was higher than incidence rate for HBV infection of the population in Japan. In our earlier retrospective study, we introduced to hepatologists 80% of the untreated HCV-infected patients who were identified when they visited a particular dental clinic in Fukuoka prefecture of Japan . As a result, 60% of the untreated HCV-infected patients completed antiviral therapy and all achieved SVR. Furthermore, we examined prospectively the frequency of referral for OLP and viral infection of patients who visited dental clinics in Yamaguchi and Shimane prefecture of Japan . In this study in Ehime prefecture, we could not determine the outcome of the patients because of the short observation period of 3 months. However, if observation is carried out over a longer period, the research effort will surely achieve a breakthrough in solving the problem of hepatitis in Japan. It was found that Japanese dentists did not have sufficient knowledge of viral hepatitis. According to a survey targeting members of the Japanese Society of Dental Practice Administration, only 39.9% knew of OLP as an extrahepatic manifestation of HCV infection, 22.2% carried out medical examinations regarding OLP in HCV-infected patients, and 70.6% wished to participate in seminars providing information on hepatitis . In Japan, in order for dentists to efficiently introduce hepatitis patients to hepatologists, dentists must first acquire knowledge about oral extrahepatic manifestations and the latest treatment for hepatitis. Secondly, it is necessary to build a system of medical cooperation to achieve the aim of treating these individuals. In this study, we examined prospectively the relationship between OLP, HCV, and HBV infection in 19,077 patients who visited general dental clinics. 47.6% of OLP patients had liver disease. Among the OLP patients, 33.3% had HCV-related liver disease and 9.5% had HBV-related liver disease. Many dentists need to be informed that they may make an important contribution by identifying untreated hepatitis patients. We thank the Ehime Dental Association and Mr. Y. Kawahigashi (Saga University) for support of this study. We are also thankful to Dr. K. Tabuchi, Dr. M. Sasaki, Dr. T. Ogata, Dr. Y. Imura, Dr. K. Ii, Dr. H. Terakawa, Dr. K. Kutsuna, Dr. N. Matsumoto, Dr. M. Inada, Dr. K. Masuda, Dr. H. Kuninobu, Dr. H. Ota, Dr. M. Noma, Dr. S. Shimizu, Dr. T. Saeki, Dr. T. Matsumae, Dr. Y. Uno, Dr. T. Naono, Dr. H. Komoda, Dr. N. Kubo, Dr. M. Takeoka, Dr. T. Imai, Dr. M. Takaoka, Dr. K. Ishino, Dr. T. Yoshida, Dr. K. Okamoto, Dr. R. Yakushiji, Dr. H. Kato, Dr. Y. Omori, Dr. I. Kaneko, Dr. F. Hino, Dr. N. Tarumi, Dr. T. Tochigi, Dr. T. Tamada, Dr. F. Namitaki, and Mr. Y. Hiasa for providing data. Yumiko Nagao (the corresponding author) created the design, adjusted results, and wrote the manuscript. Shinji Nishioka collected information. Keizo Koresawa supervised the project. All authors read and approved the final version of the manuscript. This study was supported in part by a Grant-in-Aid for Scientific Research (C) (No.17K12012) from the Ministry of Education, Culture, Sports, Science and Technology of Japan. Yumiko Nagao is a member of a donation-funded Department, funded by Okuda Internal Medicine, Circulatory Medicine and Naniwamarukaiji Inc. The remaining authors disclose no conflicts. Guidelines for the management of hepatitis C virus infection: First edition, May 2012, The Japan Society of Hepatology. Hepatol Res. 2013; 43: 1-34. Kanwal F, Kramer J, Asch SM, Chayanupatkul M, Cao Y, El-Serag HB. Risk of hepatocellular cancer in HCV patients treated with direct-acting antiviral agents. Gastroenterology 2017; 153: 996-1005. e1001. Regezi JA, Sciubba JJ, Jordan RCK. Lichen planus. Oral pathology: clinical pathologic correlations. (7th edition). Philadelphia: Elsevier; 2016. p. 97-102. Nagao Y, Myoken Y, Katayama K, Tanaka J, Yoshizawa H, Sata M. Epidemiological survey of oral lichen planus among HCV-infected inhabitants in a town in Hiroshima Prefecture in Japan from 2000 to 2003. Oncol Rep. 2007; 18: 1177-1181. Nagao Y, Nishida N, Toyo-Oka L, Kawaguchi A, Amoroso A, Carrozzo M, et al. Genome-wide association study identifies risk variants for lichen planus in patients with hepatitis C virus infection. Clin Gastroenterol Hepatol. 2017; 15: 937-944. e935. El-Rifaei AM, Fathalla SE, Al-Sheikh IH, Tinguria MB, Qadry YA. The prevalence of indices of hepatitis C and B infection, and elevated aminotransferase enzymes in patients with oral lichen planus (olp) in eastern saudi arabia. J Family Community Med. 1998; 5: 39-43.